When Calli Courtnae breaks the World Record for the 100m, she is invited to Montana to prepare for National tryouts. However, upon arrival using her lip reading ability she realizes she’s been lied to, or at least not told the whole truth. She's a superhuman, a Runner, and her new world includes transporting packages for other supernatural groups. She’s paired up with an overly anxious Gothic roommate, is continuously glared down by the gorgeous top-dog, Chris, who feels she doesn’t belong, and is placed on a delivery team to transport a valuable magical diamond to a clan of terrorists who can kill with their thoughts. Chris, the team leader, is given the diamond, but Calli secretly receives the real stone along with a vision of the future and an explanation of why she was hand selected to carry out the mission. Almost immediately the hidden diamond oozes unprecedented additional powers and abilities in Calli making her more sought after than the diamond itself. 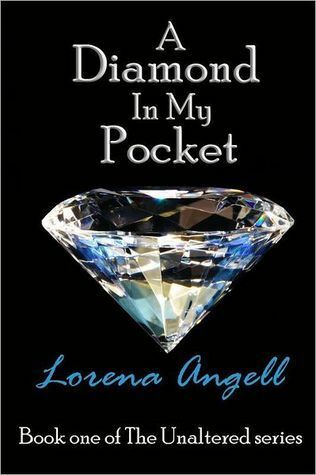 A Diamond in My Pocket doesn’t just have a cleverly named title. In the midst of an action packed, super powered plot, Lorena Angell introduces readers to Calli Courtnae, a determined 16 year old girl with a lot to learn about life. After breaking a world record in track, Callie’s escorted to a compound housing people with the ability to run faster than normal humans, Runners. Calli not only stepped into this world of powerful beings without any knowledge, but at a time when three Runners are being held hostage. Her journey really begins when she’s recruited to the rescue team and charged with a dangerous mission and powers. I really liked the idea of the story. Cosmic energy blasting humans and giving them abilities is not what I’ve seen in YA lit, so it was a fun read. There’s a lot of mystery surrounding the different clans of powers, so prepare for many surprises throughout the story! Angell has a knack for creating dynamic female leads. Calli is a strong character from the beginning but as the story progresses, she becomes fearless and selfless. She even comes to accept herself as more than an average ‘muck’. The minor characters kind of faded into the background even though they were with Calli through most of her task. Calli was so independent and hardly ever needed anyone else, except for advice. Most decisions she made were based on what others advised her on, so she wasn’t impulsive or foolhardy. If my life depended on Calli Courtnae to swoop in and save me, I’d be totally fine. She learns to exercise self-restraint in a world filled with pain and death even when she may be able to help. With A Diamond in My Pocket’s ending, I don’t know exactly what to expect will happen in the next book in the series: A Diamond in My Heart. Wow, this seems like a pretty interesting book. I might have to take a look at it. Great review.